We started the day off with Jaime & her bridesmaids at the Hilton just a few minutes up the road from the venue. We are so accustomed to walking into complete chaos when we arrive at the hotel that we were almost taken aback by how calm & quiet the room was! Hair & makeup was finished up before we arrived, so we gathered everyone together for a couple of group photos with their matching "I'm Getting Meowied" cat tank tops. The bridesmaids put on their dresses--after a couple of wardrobe malfunctions that were quickly repaired by MVP Maid of Honor Justine--and packed up Jaime's dress, then made our way to the Glastonbury Boathouse. Kyle, his parents, and all of the groomsmen gathered by the fountain so he could give the guys their groomsman gifts. This was the perfect spot to photograph the guys & the family of the groom; it was just a 1-2 minute walk from the building, but secluded enough that we were able to easily keep our bride & groom from seeing each other until they were walking down the aisle. Kyle cracked open a bottle of Van Winkle Special Reserve 12 Year Bourbon Whiskey & toasted to his groomsmen before lining up for the ceremony. We love a non-white wedding dress! The blush pink color of her lace dress was a lovely alternative to a traditional white gown. While the guys were hanging out around the fountain, the ladies were in the bridal suite at the Boathouse putting on the finishing touches. Justine & the bridesmaids helped Jaime into her dress, then we popped outside for some photos with the ladies & the father of the bride before all of their guests arrived. The bride-to-be enjoying a quick quiet moment waiting for the ceremony to begin. This must be the best wedding ceremony location in Glastonbury. 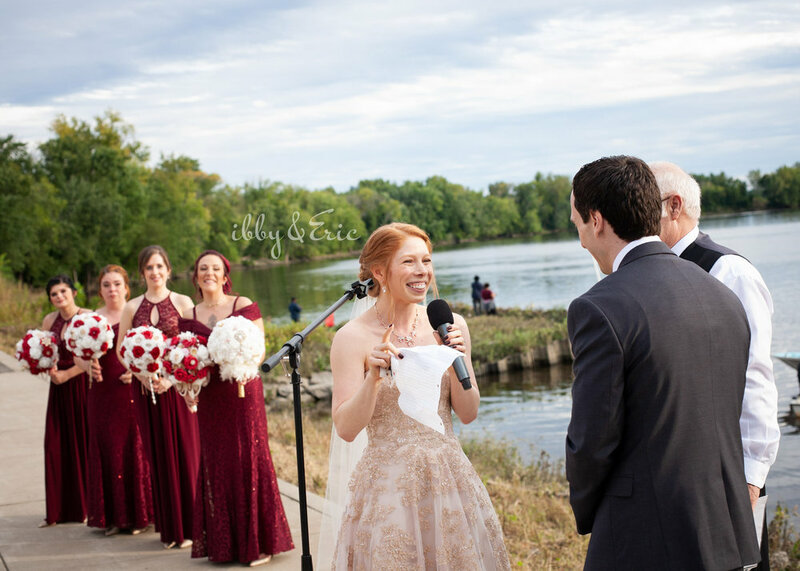 With such a gorgeous view of the Connecticut River, and your reception just steps away—you really can’t beat it! Not to mention, Jaime & Kyle got married on the most perfect September day! Kyle's dad was the officiant and had the honor of marrying his son and daughter-in-law. It's so special when couples are married by somebody who is close to them! Here’s their official first photo of the bride & groom together with both sides of the family! Can't get enough of these two & want to see more photos from their reception?? Stay tuned for Part 2 of Jaime & Kyle's big day!!! Maria & Mike's Snow Day Family Session in Westfield, MA.